Background: In this conversation from November 3, 2011, Reverend Clark Lobenstine shares his background in interfaith dialogue and community service with Nafees Ahmed, a Berkley Center Research Assistant. Rev. 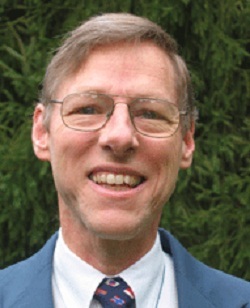 Lobenstine serves as the Executive Director of the InterFaith Conference of Metropolitan Washington (IFC). He is also the Parish Associate (volunteer assistant minister) at the Silver Spring Presbyterian Church. In this conversation he reflects on the work of the IFC does in the Washington, D.C. community and shares advice on how to spread interfaith work, calling all Hoyas to action. Tell me about your personal journey into interfaith work. I grew up as the son of a foreign service officer and I lived in five countries by the time I was 10 years old. I was born in Bogotá, and have lived in Peru and Germany. In the process I lived in Beirut, Lebanon were I lived two blocks from a mosque and heard the call to prayer five times a day. My real introduction to Islam and other world religions was when I joined the InterFaith Conference as the first Executive Director in 1979, 32 years ago. Early on in the Interfaith Conference I went to a retreat at a volunteer service center on InterFaith through InterFace. It was a chance for people of diverse faiths to meet face-to-face and talk between Muslims and Christians, for example. More recently we have published a book, in which a practitioner of each of our eleven represented religions at the Interfaith Conference answers the same set of 42 questions. It is now a resource particularly for high school teachers who expressed their deep appreciation. It is useful because it is an insider’s perspective and answers the same set of 42 questions across the board. Since this is a living document we also publish supplements about the symbols and values of each faith. We just published one on the environment, one on freedom, and one on scriptures of different religions. For the scriptural supplement, we included the passages that unify and divide us, and how different believers understand those passages. Did the influence of your mother as a social activist and grandfather as a minister influence your decision to work in the church? In terms of my personal background, I was in Beirut from first to third grade. The community school we went to was American. I remember running around the track at American University in Beirut. So interfaith community building was instilled in me at a young age. This was largely due to the views of my parents, we were involved in the church, and every Sunday we would invite various guests over for dinner. My grandfather was a Presbyterian minister and missionary in China for 32 years. My mom was a social activist. Because of this background I had experience with social activism and interfaith dialogue from a young age. Also, my father was a diplomat and I learned a lot from him in my ability to be diplomatic with others. I grew up in the church and made a conscious decision to join when I was in eighth or ninth grade. My family and I moved to Washington, D.C. for seventh to twelfth grade after Confirmation, a ceremony much like a Batmizvah and the coming of age tradition in the Muslim faith. The IFC works not only in interfaith dialogue but also interfaith action. Could you please speak to that? The Interfaith Conference was founded by the Islamic, Protestant, Roman Catholic, and Jewish communities and was the first organization to engage the Islamic community back in a metropolitan area in both interfaith dialogue and interfaith collaboration for justice in 1978. Since then Baha’i, Hindu, Buddhist, Jain, Latter Day Saint, Sikh, and Zoroastrian believers have joined. We now represent eleven faith-based communities. The founders before I started were clear that the Conference wouldn’t do service, but rather enact justice by building a just community as well as through interfaith dialogue. These principals continue to guide us still and our Center for Nurturing Understanding is focused on applying those ideals to young people. One of the things we do without being a direct service agency is compiling "The Emergency Food, Shelter and Health Care Directory" each year. Research has shown that about 300,000 people a year are helped in the area, and our entries have climbed to about 400 entries in the directory. Now if a homeless person comes to a soup kitchen, which can feed him but cannot provide health care or housing, the soup kitchen staff or volunteers can look in the directory to find the places where he or she can get shelter and medical care. We update the information annually and publish and widely distribute it free of charge. Do interfaith groups have a unique place in service work and social justice? Yes and various people in social justice are becoming more aware of that. For example you have a lot of people now involved in Occupy D.C. and Occupy Wall Street. Religious communities have sadly not been so much involved. However there is also a recognition now that they are missing something. This is a spiritual and ethical base for what we are doing. They are turning to the religious community to find that. This is important because religious communities are involved in service work and are motivated by their faith commitments to do this work. How can we make more people aware of these issues? Personal interaction is key. The fact that Occupy involves homeless people as well as middle class people means they have the opportunity to talk face-to-face to people they otherwise would not have met. I think those bridges are very important. Hearing Arun Gandhi, the grandson of Mahatma Gandhi, speak is going to touch people in a way that hearing a lecture on him cannot do. For example when Arun Gandhi spoke at the 9/11 Unity Walk in Washington, D.C. this year, he told us about a summer he spent with Mahatma Gandhi. That was powerful and inspirational; he told us something personal about what makes him the way he is. This is something that cannot just be gained by seeing if he has this or that degree. I think interfaith is one piece of the pie. We just celebrated the twenty-fifth anniversary of the Assisi Gathering in Italy where Pope John Paul II brought together leaders of different religious communities to pray together for the first time in history. We had a local celebration at a monastery. Many came because they were inspired by the Pope. People of many different religious traditions also came. For everyone who came it was a remarkable experience. People thought, “I’ve never spoken to a Zoroastrian before and they’re really not so weird”! I think it is these interactions, when you speak with people one-on-one whether it’s this Assisi gathering celebration or Occupy D.C., we are creating bonds. What is your message to the average Georgetown student? Well, none of them are average, of course! You have a wonderful and unique opportunity in your college years to get to know people of different races, faiths, cultures, and nationalities. Make good use of it! Our country is getting increasingly diverse and you are likely to work with people or live next to people of other traditions. If you take the opportunity in college you will be better able to make use of the opportunities later and feel much more comfortable doing so. What are the broader implications of the president's Interfaith and Community Service Campus Challenge? I think it is a wonderful opportunity to make a difference. I think the Interfaith Challenge is a great opportunity to lift up causes you might not normally deal with in your normal university life. It also allows people to realize that what they do, does make a difference. They do count. Whether you are painting a house, raking a yard, cleaning out an attic, whatever the form of community service, you are making a difference. That message is a very powerful personal experience for me.